When I checked the most expensive bid for a fashion accessory, the CD designed with 10 2-carat diamonds on a platinum case topped my search. It is priced at $100,000. This was designed by a Japanese jeweler Nagahori. 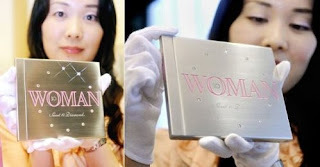 This CD dubbed as "Woman, Sweet 10 Diamonds" contains 18 songs of known female singers. This is indeed a glamorous and sparkling taste for music. One can find now any fashionable accessories like bags, watches, rings and more for online auctions . My sister in-law once purchased a Louis Vitton bag at reasonable rate and good condition. The net is indeed another way to search for beautiful fashion.